Fully featured Analog Through Zero Oscillator. Capable of a wide array of tones and timbres. Go from rich melodic waves straight into FM craziness! The EN129 is based on the pioneering work by Douglas Kraul and Bernie Hutchins. You can read the original Electronotes article from 1981 that the design is based upon here. 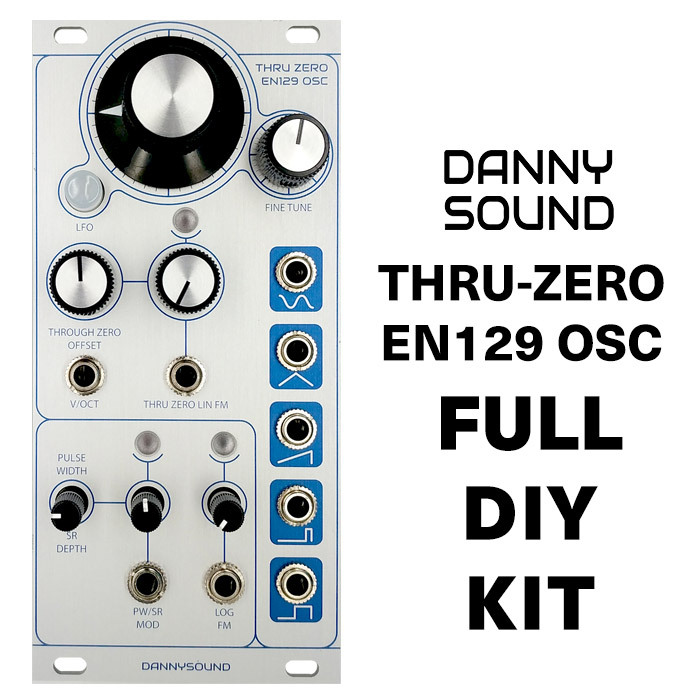 The EN129 Thru Zero Oscillator is an all analog triangle-core VCO specialising in frequency modulation. Analog thru-zero FM modulation produces a wide array of timbres particularly useful for bell like or percussive sounds. Frequency modulation can be precisely dialled in thanks to a dedicated input attenuator and v/oct offset control. Logarithmic FM is also available via it’s own dedicated input with attenuator and both FM inputs have an LED to indicate incoming voltages. Simultaneous analog wave outputs include: Sine, Triangle, Sawtooth, Square and Pulse wave with Pulse Width Modulation. The PWM control goes to zero at either end of it’s range, which is very useful for creating rhythmic sounds with voltage control. Furthermore the PWM control doubles up as waveshape modulation for the Sawtooth wave – gradually altering the waveform until it shifts half a cycle. The EN129 features Coarse and Fine frequency controls as well as an LFO mode. 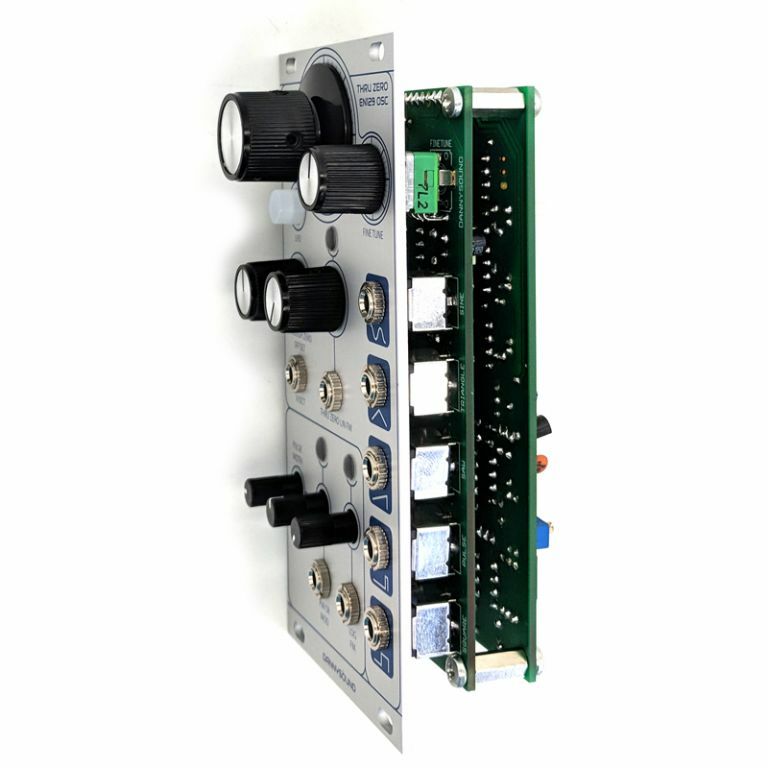 LFO range is accessed via an LED pushbutton that also acts as the LFO speed indicator – the button will light up when the waveform moves through its positive cycle. 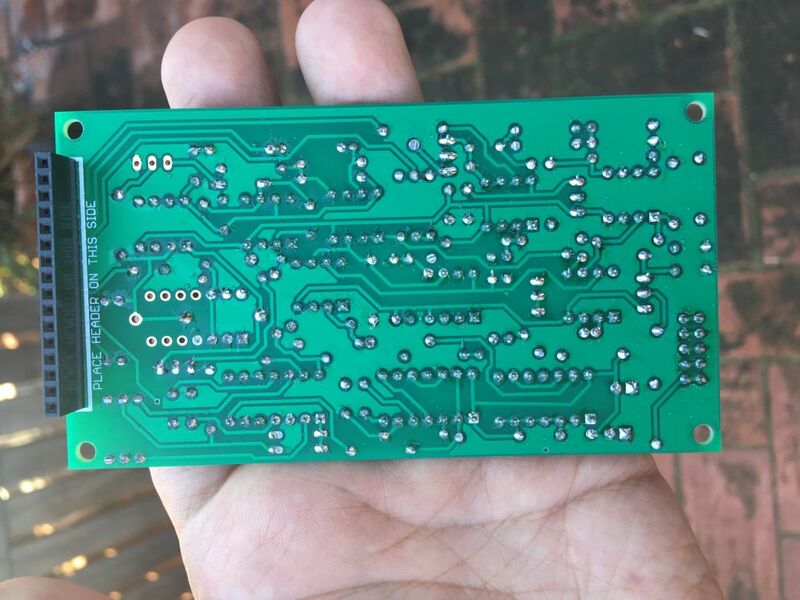 All Through-hole build – no SMD components! Hey, are there going to be schematics released for this or the Cali OSC? I want to know if i could build it with my own panel design or add / remove features to my taste. I feel like it's unreasonable not to provide schematics for these builds because they are both based on openly available oscillator designs, and seemingly make only small changes to each. It sounds really deep and thick in the teaser as they are FMing each other, but is it possible to have the standalone demo for each oscillator to see how actually good they are? Is there any possibility that the Thonk kit will have a black panel option for this? It's not impossible, but not in the next couple of months. I like the look of both of these, but I wish he had created a better brand name. I am not sure I want to have modules with 'DannySound' sitting in my rack. The Thonk kits are labelled for 'Advanced' builders. Looking through the build guide, there doesn't seem to be anything particularly challenging - all through-hole. You do need an oscilloscope for calibrating, but a PC app could handle this. Maybe it's because of the price? GBP195 is a lot to drop if there is a risk of mistakes (not saying it is unreasonable). Will be getting one of each when I have the cash. Would pay extra for black panels! The Thonk kits are labelled for 'Advanced' builders. Well it's "Not recommended for beginners" that we say specifically on the site and documentation, they are nicely laid out boards with nothing particularly tricky part by part but the price and length of the build do lend themselves better to builders with a few modules under their belt. 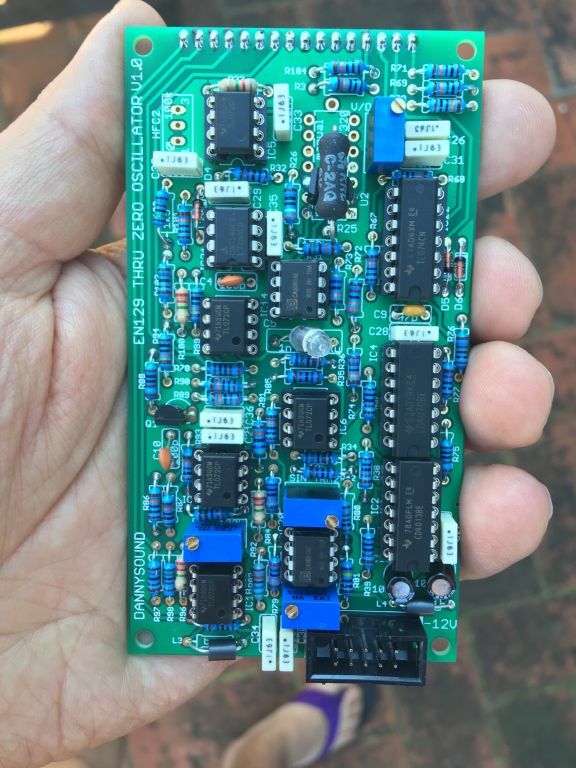 If, as seems likely, this module is based on the Electronotes 129 through zero VCO, I think it would be more than appropriate to give credit to the original designers in the documentation and product page, and to include a link to the original article, which Bernie has made available for free. It's great that this oscillator will be readily available for people, but I find it pretty disappointing that this credit hasn't been given. The one i read required a scope...so thats generally classed as advanced. Nah it's strictly looking at audio rate AC to check waveform shapes, you could it by recording wavs on a computer and inspecting them or just using a free oscilloscope app, or by ear even if you are used to trimming sine waves to remove harmonics. There is an optional step on the Cali to remove DC-offset where a scope is a bit quicker, but again this is easy to just see visually on a computer. igowen, well you won't damage anything if those measurements are accurate I don't think but it's obviously a lot less than ideal. However have you checked your power supply voltages to check you don't have an imbalance there also? i did, although i use a cheapo power supply when testing DIY stuff so i don't accidentally blow up my good ones i'll try a different PSU tonight as well as double check all the resistors (fun). the rest of the build was pretty straightforward. the only real difficulty i had was getting the LEDs seated properly on the light pipes. re-measured and got +/-12V. only difference from the previous day was that all the ICs were installed. no idea but everything seems to be working fine. There is a slight mistake in the build guide, please use pin 6 instead of pin 5 for the ground reference in power test part of the build procedure. This won't have caused any problems other than slightly off voltage readings, sorry about that. The build guide will be updated. If SINE_TRIM2 is getting hot it means it's conducting too much current. Can you try removing the ICs and measuring voltage again with ground as mentioned above. Also check the resistance across SINE TRIM2 (without power switched on!). Set it to around 42k ohms. If that checks ok then try inserting the ICs again one by one and check voltage as you go. thank you for the reply, I had 100R trimmer instead 100K now all is good, very cool module!! Thanks for that link. I was going to look for it. It's great that Bernie Hutchins made it available to download. I have the full EN collection. My Thonk full kit is on order!